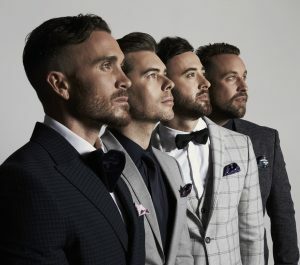 Ahead of performing at Sheffield City Hall on 3 December, we were delighted to interview Mark Franks from The Overtones. Me: Tell us more about yourselves and what you have been up to? Mark: We’re just putting the finishing touches to our 6th album which is out October 26. It’s crazy to think it’s nearly been 9 years since we started this Overtones journey, and we can’t wait for people to hear the new music. Me: What can we expect from your forthcoming tour? Mark: The Overtones tour is basically an excuse for one big party. It’s a celebration of all these classic hits and all I will say is… bring your dancing shoes. Me: What are you looking forward to most about performing in Sheffield? Mark: As a northerner myself I love a good northern crowd. We know how to bring the party and they are always the first on their feet. Me: How have fans reacted to the sad passing of fellow band member Timothy Matley earlier this year? Mark: The outpouring of love and support has been so overwhelming. We know how lucky we are to have such loyal fans and never take that for granted. Their ongoing tributes to Timmy have been so special. Me: You have a back catalogue of great songs, but what are your favourite songs to perform live and why? Mark: Can’t Take My Eyes Off You is always a winner. It has the audience singing to the rafters and is a great opener, or ending to an Overtones show. Our song Giving Me Soul, is always a great moment too. There’s something about an audience singing back lyrics we wrote… It is a great feeling which will never get old. It’s so humbling. Me: On the same lines, are there any songs that you would love to give The Overtones treatment but haven’t been able to? Mark: There’re loads!! We always pull a modern cover out of the bag for tour. Like Uptown Funk, Get Lucky and Shape of You. As a big George Michael fan though, I’d love us to tackle one of his classics. Faith, or Kissing a Fool maybe? Me: You have included a cover of the Aretha Franklin classic “I Say A Little Prayer”. What influence did the recently departed soul legend have on you? Mark: Her influence as a soul legend is incalculable. Growing up i loved my 80s choons. Songs like I Knew You were Waiting, Who’s Zooming Who and Pride, A Deeper Love are always playing through my EarPods. Me: Your gig is at the start of the festive season, but if you could have anything for Christmas what would you ask Santa for? Mark: Hmmm. Maybe some CDJs. I quite fancy myself as a bit of a Fatboy Slim. Me: And finally, you were discovered by a talent scout when working as decorators. If you could have any other job apart from singing, is decorating what you would choose or is there another dream career out there for you? Mark: Haha. We were working as decorators as a means to pay for our studio and rehearsal time as a band. I started my London life as a professional dancer, having trained at the Royal Ballet School as a kid. I was lucky enough to have a career in dance for 10 years before we got signed as The Overtones. I would have probably moved onto choreography by now. Although those skills still come handy from time to time as an Overtone. The Overtones will be performing at Sheffield City Hall on Monday 3 December. Tickets cost £25.20 to £43.12 including booking fee, with VIP tickets available for £110.88. To book visit sheffieldcityhall.sivtickets.com, telephone 0114 278 9789 or visit the Sheffield City Hall box office in person. You can also catch The Overtones around the country on their 2018 Christmas Tour including at Watford Colosseum on 22 November; The Pavilion, Bath on 23 November; Princess Theatre, Torquay on 24 November; Regent Theatre, Ipswich on 26 November; Assembly Hall and Richmond Room, Worthing on 27 November; Leas Cliff Hall, Folkestone on 28 November; Bournemouth Pavilion on 30 November; Venue Cymru, Llandudno on 1 December; Baths Hall, Scunthorpe on 4 December; Cambridge Corn Exchange on 5 December; Cliffs Pavilion, Southend-on-Sea on 7 December; Symphony Hall, Birmingham on 8 December; Bridgewater Hall, Manchester on 10 December; Royal Concert Hall, Glasgow on 11 December; Sage Gateshead on 13 December; York Barbican on 14 December; Theatre Royal and Royal Concert Hall, Nottingham on 15 December; Philharmonic Hall, Liverpool on 17 December; City Hall, Salisbury on 18 December; G Live, Guildford on 19 December; and finishing at Indigo at The O2, London on 20 December. For further information on The Overtones visit www.theovertones.tv. The interview was fabulous to read and so interesting. We are seeing The Overtones at Birmingham and then again at Nottingham, that is for my 70th birthday. Just love the Overtones, can’t get enough of them. I play them everymorning when I get up as it sets me up for the day. The boy’s are so brave in carrying on without Timmy but I do think it is what Timmy would have wanted and he WILL be with the boy’s all the way. Love to them all and God Bless them and Timmy. I have a small tribute gift for the boy’s when they are at Nottingham and there is something for Timmy’s family and a tribute to Timmy as well. Have ent 3 messages now. Loved the interview and found it very interesting. I love The Overtones and play their music every morning when I get up and it gets me through the day. Mu hubby and I areseeing the boy’s at Birmingham and Nottingham for my 70th birthday. Sadly we couldn’t V.I.P as tickets were all gone, we are in row D so look out for ‘ RUN AROUND ‘ SUE.. I have tribute gifts for you boy’s and Timmy’s family and a tribute for Timmy, just hope I can put them on the stage as we can’t meet the boy’s. They are so brave in carrying on without Timmy but Timmy will be with the boy’s all the way. God Bless you all and Timmy too.